Hematologic malignancies are common and difficult to treat in older adults. In this review, we focus on recent updates in diseases with several novel agents relevant to older adults—acute myeloid leukemia (AML), chronic lymphocytic leukemia (CLL), and multiple myeloma (MM). In AML, CPX-351 offers a new induction chemotherapy for secondary AML that prolongs survival, and venetoclax and IDH inhibitors are efficacious and well tolerated. In CLL, chemoimmunotherapy is being replaced by monoclonal antibodies and small molecule inhibitors that are more effective and better tolerated. In MM, new immunomodulatory drugs, proteasome inhibitors, and monoclonal antibodies have expanded treatment options for older patients. 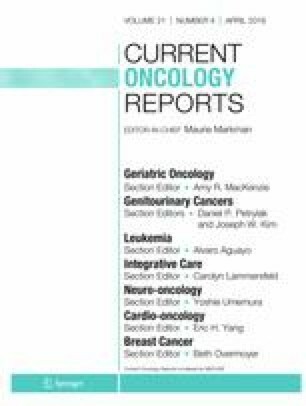 The introduction of novel agents has dramatically shifted the landscape of therapeutic options for older adults with hematologic malignancies. Clinical trials in older adults are needed to expand treatment options for these patients. Sandy W. Wong has received research funding from Janssen, Celgene, and Roche. Charalambos Andreadis has received research funding from Celgene, GlaxoSmithKline, Novartis, Amgen, and Pharmacyclics; has received compensation from Amgen for service as a consultant and from Celgene, Gilead, Pharmacyclics, and Genentech for service on advisory boards. His spouse is also an employee of Genentech. Rebecca L. Olin has received research funding (salary support, principal investigator) from Astellas, Daiichi Sankyo, Pfizer, and Genentech, and has received compensation from Jazz Pharmaceuticals and Genentech for service as a consultant. Li-Wen Huang declares that she has no conflict of interest. She is supported by the National Institute on Aging (T32AG000212). Noone AM, Howlader N, Krapcho M, Miller D, Brest A, Yu M et al. SEER Cancer Statistics Review, 1975–2015, National Cancer Institute. Bethesda, MD. https://seer.cancer.gov/csr/1975_2015/. Accessed 3 Oct 2018. Cortes JE, Heidel FH, Hellmann A, Fiedler W, Smith BD, Robak T et al. Randomized comparison of low dose cytarabine with or without glasdegib in patients with newly diagnosed acute myeloid leukemia or high-risk myelodysplastic syndrome. Leukemia. 2018. https://doi.org/10.1038/s41375-018-0312-9. Beat AML Master Trial. https://www.lls.org/beat-aml/beat-aml-for-healthcare-professionals. Accessed October 1, 2018. •• Woyach JA, Ruppert AS, Heerema NA, Zhao W, Booth AM, Ding W, et al. Ibrutinib regimens versus chemoimmunotherapy in older patients with untreated CLL. N Engl J Med. 2018;379:2517–28. https://doi.org/10.1056/NEJMoa1812836. In this phase 3 trial for untreated CLL patients aged ≥65, ibrutinib alone or in combination with rituximab was compared to bendamustine-rituximab and with each other. Two-year PFS was higher with ibrutinib alone (87%, HR = 0.39, p < 0.001) and ibrutinib-rituximab (88%, HR = 0.38, p < 0.001) compared to bendamustine-rituximab (74%); there was no additional benefit of adding rituximab to ibrutinib. The ibrutinib-containing regimens were associated with fewer grade ≥ 3 hematologic adverse events compared to bendamustine-rituximab (40% vs. 61%) but more grade ≥ 3 nonhematologic adverse events (74% vs. 63%), with hypertension and infection being most common. The results of this study suggest there is no longer a role for cytotoxic chemotherapy for older patients with CLL. O’Brien S, Patel M, Kahl BS, Horwitz SM, Foss FM, Porcu P et al. Duvelisib, an oral dual PI3K-delta,gamma inhibitor, shows clinical and pharmacodynamic activity in chronic lymphocytic leukemia and small lymphocytic lymphoma in a Phase 1 study. Am J Hematol 2018. https://doi.org/10.1002/ajh.25243. Broderick JM. FDA Approves duvelisib for CLL and follicular lymphoma. https://www.onclivecom/web-exclusives/fda-approves-duvelisib-for-cll-and-follicular-lymphoma. Accessed 3 Oct 2018.